An initial rendering of a planned 200,000-square-foot residential, office and retail complex to be constructed in Kendall Yards. In 2010, Greenstone Homes began to fill in the vast swath of empty space in the center of the maps of Spokane. The Kendall Yards development has taken the 78-acre scar of old railroad land just north of downtown, and slowly began to occupy the gaps. Over the past seven years, townhomes, lofts, cottages, restaurants, retailers — and even the Inlander — have sprung up. But major significant blank spaces remain in the Kendall Yards development. Most obviously, there's the flat, windswept expanse of snow and rocks stretching from the Inlander building to the Monroe Street Bridge. Last fall, it had been repurposed as a dirt parking lot. But now, that — and many of the other gaps in the Kendall Yards properties — are about to be filled in, as Kendall Yards gets bigger and denser than ever. Nearly 200,000 square feet of residential, retail and office space will be constructed in the space between the Inlander building and the Monroe Street Bridge. During the summer, it had been used as an ad hoc parking lot for Kendall Yards' Wednesday Night Market events. But Kendall Yards won't lose any parking to the new complex. 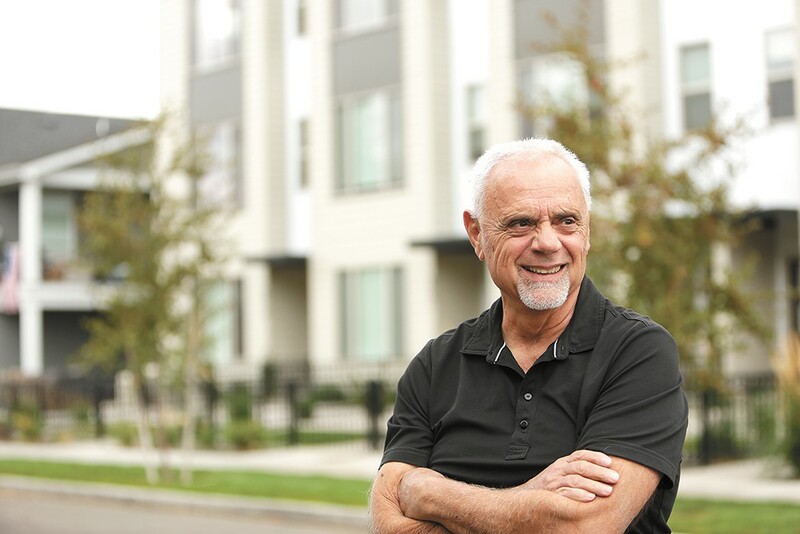 "We always saw it as a larger mixed-use building over an underground parking garage," says Jim Frank, founder of Greenstone Homes, Kendall Yards' developer. He says this sort of strategy has always been part of the Kendall Yards plan — the south side of the project would be more dense, relying on structural parking instead of surface parking lots. And while a parking pass will be required during the day, Frank says that after hours, the parking will likely be free. "Economically, it's a just a big project. Its probable total value is $50 million," Frank says. "It's a big project for downtown Spokane, it's a big project for Greenstone." Greenstone's new independent grocery store is still on the way to an early summer opening. So far, the plan includes a spot for wine and/or cooking classes, an outdoor patio seating area, and a second floor patio. "We're [eager] to provide a wide range of services to West Central," Frank says. "Medical services were one of those underserviced areas." The 30,000-square-foot, three-story building will open this month, with a Providence clinic on the first floor, a Columbia Medical primary care clinic on the second floor, and a range of ancillary medical services — including, possibly, U-District Physical Therapy. The Columbia Medical clinic used to be located on the Deaconess campus, says Columbia Medical facilities manager Tim Craig, but with their lease up, moving to Kendall Yards made perfect sense. "Navigating the hospital campus was difficult for our patients, especially for our primary care patients. But it was important for us to stay close to downtown," Craig says. "We really liked the area and what's happened in Kendall Yards." In the empty space farther to the northwest near the Olmsted Brothers Green park, Greenstone plans to build two new commercial buildings, totaling about 7,000 square feet. Think of the tiny business district that includes the Elk in Browne's Addition. That's what Frank is going for. One building, adjacent to the Centennial Trail, will feature a restaurant and coffee shop. The other, facing the park, will be a small, mixed-use retail spot, with restaurants and three residential spaces. The trickiest part of building out Kendall Yards, Frank says, is finding small, independent retailers. "You're not in a situation where the retail market is growing," Frank says. "The retail market for brick-and-mortar stores is shrinking." That said, he does have a wish list. "It would be nice to have a fly-fishing shop. Because the river is so close, it provides convenient access for people who might want to float the river," Frank says. "An REI-like place where you could get bicycles and fitness equipment and clothing. That's the kind of retail that would be nice in the neighborhood."